Out shopping for something nice to bring home to my grandmother after her long week of travel, I decided to pick up some flowers. When I saw that calla lilies are in season, the decision was made! They're classic, and easily fit into the color palette in any room. As a token to my appreciation for photography, this photo was taken in a style that contrasts light and dark. You can't kind of imagine the squeal I let out at this photo's review! I was so pleased with the image because it was on accident. You had to be there. 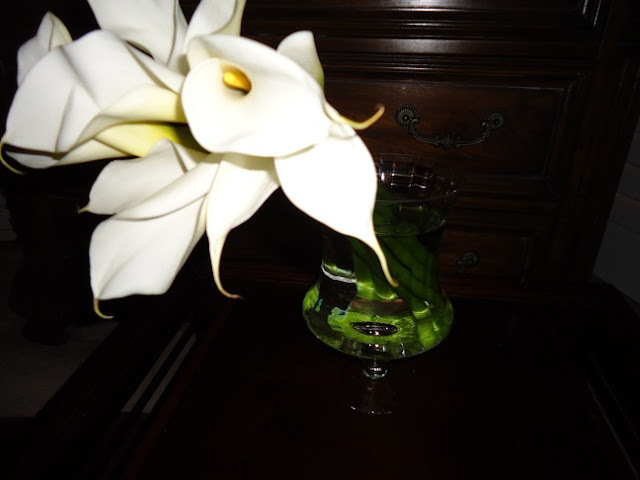 My camera is simple, but I guess I did well to showcase the visually stunning simplicity of the California grown calla lily. Hope she likes them!